House made Charcuterie and an order of house made pickles. I love this place. 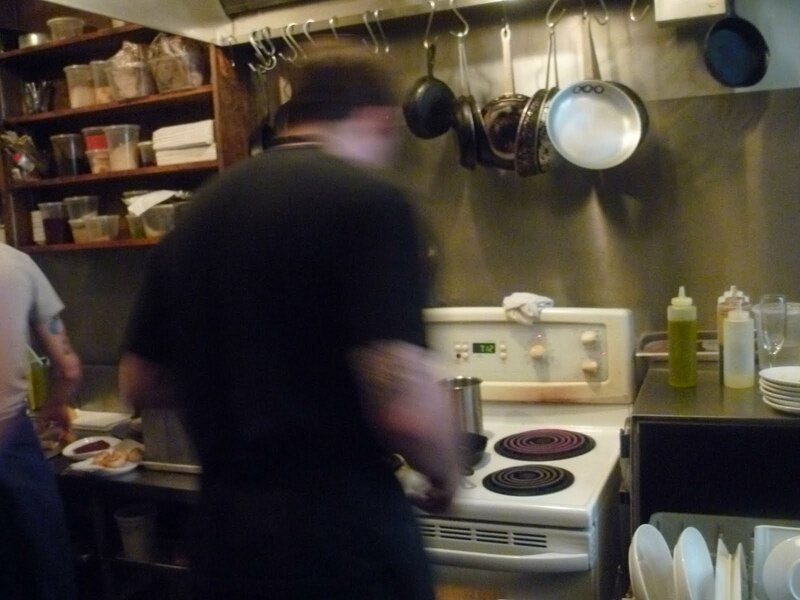 The Black Hoof is a small store front restaurant in Toronto’s uber hip west side. 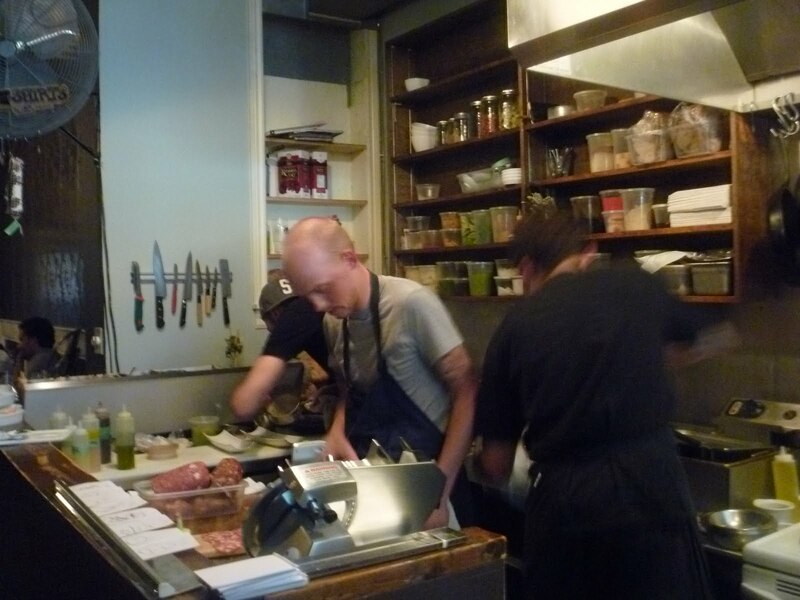 It’s the kind of casual, locavore, food centered place with a laid back, funky vibe that has taken over Williamsburg. 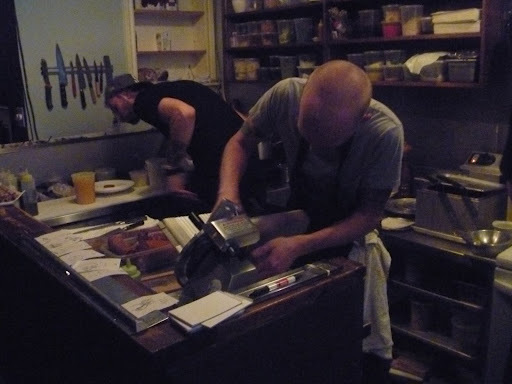 Located at 928 Dundas street in Toronto, The Black Hoofdoesn’t take reservations, are closed on Tuesday and Wednesday, but thankfully (for me) are open on Monday. My advice is get there early and sit at the bar where you can watch the action happen. Or if you prefer there is a small dinner room at the back and in the summer a little outside space. 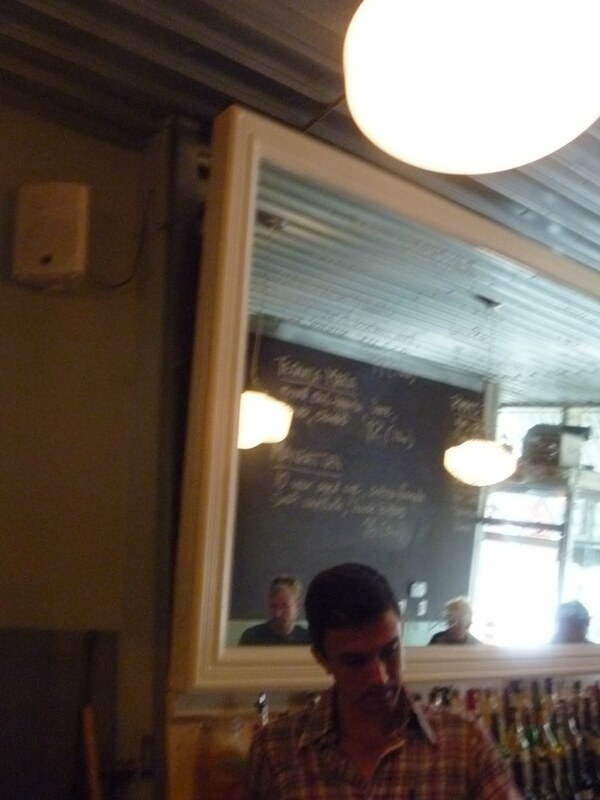 This was the mixologist (above) and our waiter the night we went. He was great, he made great recommendations and from what I could tell made an awesome cocktail as well (we were drinking beer). My brother lives with a fishaterian and I live with a guy who keeps kosher so this was our night to go hog wild on all things pork! 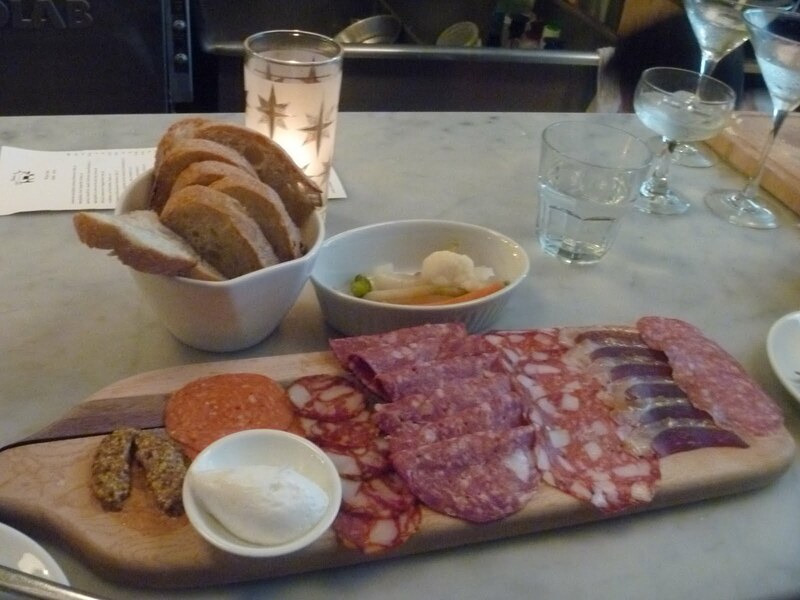 The locally sourced house made Charcuterie (pictured above) was all amazing. The platter is served with a selection of 6 Charcuterie, 2 dollops of grain mustard and a small bowl filled with lavender whipped lard to smear on your bread. I wish the lard had been served melted on grilled bread – but it certainly didn’t prevent us from eating it all up. We then had roasted bone marrow served with Maldon salt and Chimichurri, the herb garlic wonderfulness of the Chimichurri served as a perfect foil for the fatty marrow. The marrow was from a cow, so we did take a short detour from pig. 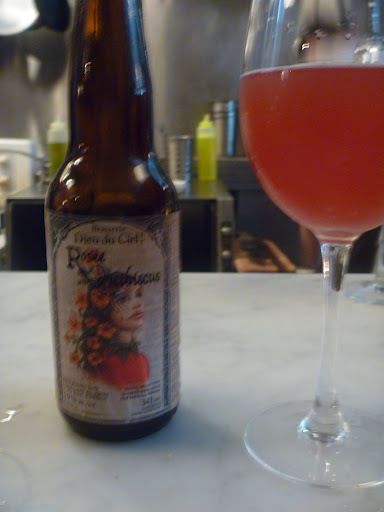 My brother David and I drank local beers until the bar keep suggested a Belgium beer made from Hibiscus – it was like drinking a funky rosé wine, I liked it, it was refreshing and a perfect foil to the meal, but I preferred my IPA. For a main course we split an order of pork tacos with pico de gallo and creamy guacamole, they are usually served as 3 to a plate, but the waiter knew we were splitting them so he had the kitchen make us four. They were brilliant, unctuous meat, perfectly cooked, topped with the citric salsa and all smoothed out by the creamy avocado. Perfect. For dessert we went down to Queen street and sat on the rooftop of the hipper than can be Drake Hotel. All in all a perfect last night in Toronto. 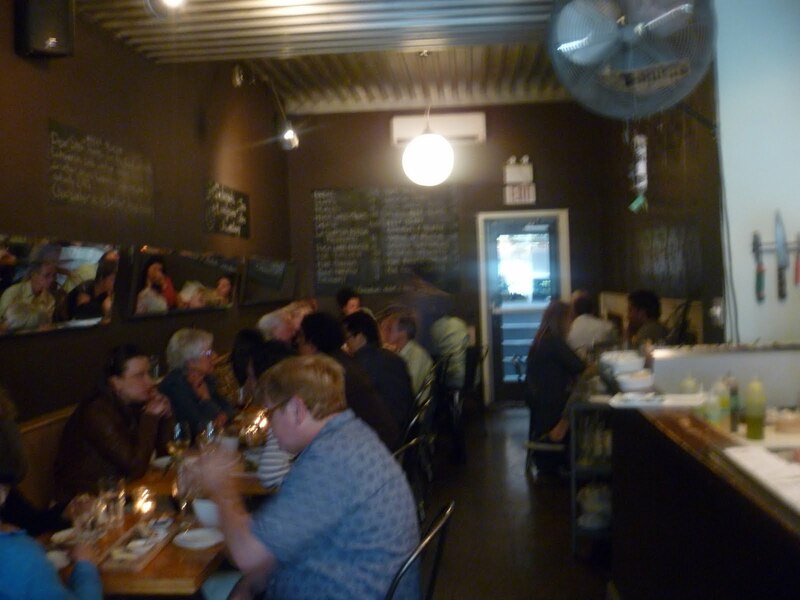 This entry was posted in Travel and tagged Black Hoof, Restaurant, Toronto. Bookmark the permalink.